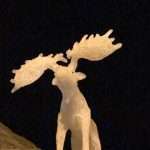 An elkish season – For the fainthearted . . .
A large white elk peered down from the top of a wall running beside the street, perhaps it was intended to be a reindeer; white plastic and illuminated, a decoration marking the season. It would have been thought bad luck in times past, not having Christmas trimmings down by Twelfth Night; we would have recalled st the idea of keeping the full season of the Nativity and leaving the crib in place until 2nd February, the day when the church remembers Mary and Joseph taking Jesus to the Temple in Jerusalem when he was forty days old. We thought it risky that a boy whose birthday fell on 8th January was allowed to keep up the Christmas tree in his house until his birthday party was over. What is odd in 2018, in a post-Christian society, is that there is still a residual inclination to keep a Christmas holiday that concludes with the Feast of the Epiphany on 6th January, the day when the Wise Men from the East are remembered (or unwise, if you actually read of their crass stupidity in going to the thug Herod and telling him of their mission). 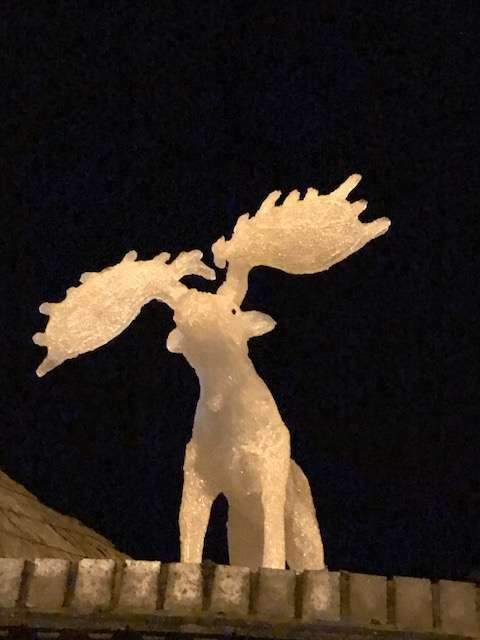 Being honest, an elk, or a moose, or a reindeer, or whatever the white plastic figure is intended to represent, is probably more symbolic of the season celebrated by most people. The Christmas holidays came to a definitive end today with the last remaining schools reopening and workplaces that had closed for a fortnight recommencing their business. The past two weeks for most people will not have been filled with thoughts of shepherds and magi, instead they will have been a midwinter festival. Apart from the aesthetic qualities of snowy landscapes, perhaps focused fires from places of snow and ice are symbols of the hope that winter can be conquered, if creatures can survive in the worst of climes, then humans, with their ingenuity, will have no problem in enduring the worst that a cold season can bring. Perhaps the time has come for a name for the season that is more representative of what it is that people actually believe, babies in mangers are not the stuff of most seasonal conversation. Detaching the word “Christmas” from activities and experiences that are at direct variance with the story that is told does not mean one is abandoning the traditional Christmas, rather one is trying to recover a sense of the Bible story, free from men with white beards dressed in big red coats, and free from the extraordinary excesses of the past two weeks.